Congolese participated in a mock election Sunday in a part of Congo that is delaying the vote until March due to the Ebola virus. 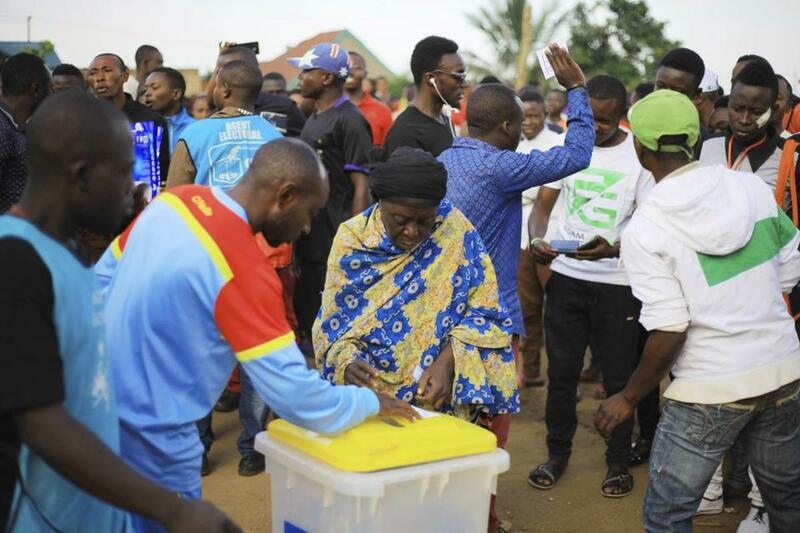 KINSHASA, Congo — Scores of polling centers had not yet opened in the capital, hours after Congo’s presidential election began, the electoral commission chief confirmed Sunday, as he faced shouts of ‘‘We wanted to vote!’’ and frustrated people walked away. The chief of Congo’s electoral commission told The Associated Press that 49 voting centers in Kinshasa were still waiting for voters lists. ‘‘We have printed lists for 29 of them and the rest are being printed right now,’’ Corneille Nangaa said while hurrying from center to center, at times handing out the lists himself. Hundreds of people waited at the Saint Raphael center in Kinshasa’s Limete neighborhood. ‘‘We are waiting to know who is supposed to vote where,’’ polling official Christian Mwangalay said. At least 6,000 people were expected to vote there. Dozens of young men decided to practice voting, piling ballots in a basket. At stake in the election is a country rich in minerals including those crucial to the world’s smartphones and electric cars, and yet Congo remains desperately underdeveloped with widespread corruption and insecurity. Unrest had been feared after a last-minute decision to bar an estimated 1 million people from voting because of a deadly Ebola virus outbreak in the east. The decision has been widely criticized as threatening the credibility of the election. Beni residents said they and others barred in Butembo city should have the right to have their votes counted. Jacob Salamu, 24, and others washed their hands before voting as a protection against Ebola, which is spread via infected bodily fluids. ‘‘We do not have Ebola. Kabila is worse than Ebola,’’ Salamu said. They will send their voting results to the electoral commission, he said. The delay has been widely criticized as undermining the credibility of the election, while some health workers have said it politicizes the outbreak and puts them in danger. Some protesters in Beni have attacked Ebola facilities. Two main opposition candidates, Martin Fayulu and Felix Tshisekedi, are challenging Kabila’s preferred successor, former interior minister Emmanuel Ramazani Shadary, who is under sanctions from the European Union. A rainstorm began voting day in the capital, flooding some streets. Kabila and Shadary voted together at the central Gombe Institute polling station. Leading opposition candidate Fayulu voted at the same polling station. Although electoral officials have estimated that people could vote in one minute, the process was taking several minutes per person, causing concern. One polling official in Kinshasa worried that the voting machines will run out of battery power. Frustration grew. ‘‘We came to vote and there is nothing. May (President Joseph) Kabila go to hell,’’ said voter Elvis Bolungu at the Limete polling station. Others just walked away.